On Friday 1st June 2018 we mark the 11th year of the death of John Moriarty. The Irish writer, poet, mystic and philosopher was a much beloved figure in Ireland. The poet Paul Durcan has described Moriarty as ‘the original, radical, non-conformist questioner’. Born in 1938 in Moyvane, Co. Kerry, Moriarty studied philosophy in UCD before lecturing at the University of Manitoba in Canada. He left academia to move to Connemara to work as a gardener. After which he retired to Kerry to live at the foot of the Mangerton Mountain. Initially published by The Lilliput Press in 1994, he became one of the greats within Irish literature. His first book, Dreamtime, delves into Irish and world mythology. This was to become a common theme in all his subsequent work. A master storyteller, Moriarty kept audiences captivated by his tales of myths, god, gardening and ordinary life. Moriarty is remembered this anniversary by Mary McGillicuddy’s new biography John Moriarty: Not the Whole Story. During a long career in education, she made the acquaintance of the extended family of John Moriarty and eventually of John himself. This book interprets Moriarty’s ideas and shares the message of his work which is often regarded as daunting to the general reader. John Moriarty: Not the Whole Story focuses on the two autobiographies written by Moriarty, Nostos and What the Curlew Said: Nostos Continued. It provides commentary and adds meaning to the passages contained within them. 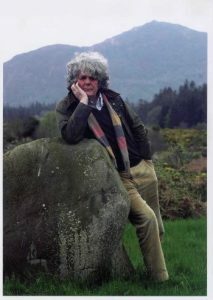 John Moriarty: Not the Whole Story will be launched by poet Gabriel Fitzmaurice in St. Michael’s College, Listowel, Co. Kerry on 1st June at 7. 30pm.